Think astrology is all about Sun signs? Think again! Astrology is actually the study of the movement of the planets from our perspective on earth. The basic astrological symbolism includes the twelve signs of the zodiac, the planets, and the houses of the astrological chart. On this site I use events and people in the news to make the symbols of astrology come to life in a way that will be educational as well as entertaining. Use the top links on the site to find previous posts of interest, especially the “Featured posts” page which will have the most current information on ongoing planetary cycles that are affecting our inner and outer worlds today. The signs of the zodiac are echoes of the similarly named constellations which are rather arbitrarily divided into 30 degree symbolic segments that trace the apparent path of the Sun around the Earth from our viewpoint. We call that path the “ecliptic.” Each zodiac sign enjoys different assets and challenges and exhibits different personality traits. The planets and luminaries (or Sun and Moon) in modern astrology are joined by a variety of other bodies such as asteroids and Chiron, which is classified as both an asteroid and a comet. In the astrological cosmology, each of these bodies represents an aspect of our personality. For example, the Moon represents our emotional nature and the way we process our feelings. Mercury reveals the way we communicate and share information. The outer planets (Uranus, Neptune and Pluto) show where we are likely to have experiences that awaken us to new realities (Uranus), transcend the material world (Neptune) or surrender to endings and new beginnings (Pluto). The signs that the planets and luminaries fall in tell us the way those aspects of our personality or fields of experience manifest in the individual. Other fields of astrology create charts for other entities such as corporations and countries (mundane astrology). 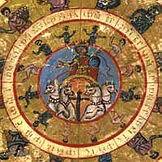 When an astrological chart is cast for a person or an event, an actual two-dimensional map of the sky at the time of the birth of the individual or the event is drawn. This map is called the “horoscope,” and it is a two-dimensional view of the solar system from the viewpoint of the individual or event. The space of the sky above and below is divided up into twelve segments which we call “houses.” Each house represents a sphere of existence, and planets which fall in those houses suggest which areas of life will be most affected. Astrologers also look at the geometric angles that the planets make to each other. These angles are called “aspects,” and they describe the way the various aspects of personality work together. The “hard angle” aspects (90 and 180 degree angles) are challenging aspects; they create conflict and tension but ultimately generate power for change. The “flowing” aspects (60 and 120 degree angles) create ease and harmony, but can induce complacency and laziness. As the planets move through the sky, they make similar angles to planets in our chart, called “transits.” The relationship between planets in the sky and planets in our own chart induce cycles of experience that can be either harmonious or challenging. Understanding the nature of these cycles can not only give us tools for navigating the rough waters, but also provides clues for timing. Finally, although our birthchart (also called the “natal” chart) never changes throughout our life, just as we are essentially the same being from birth to death, over time we change and evolve and this is reflected in the progressed chart. The progressed chart advances the natal chart and provides further clues for timing planetary cycles and events. These basic concepts are just the beginning of what can be a lifetime of exciting discovery in the realm of astrology! To learn more, check out this post.